Today was our last visit from the fourth grade classes. The fifth graders have done a really excellent job acting as either a Lunch Buddy or Tour Guide for the elementary students. Each day we had visitors,they eagerly came to my room to make sure we had made them a name tag or had their official "tour guide clipboard" ready. I am really proud of how well behaved, well-spoken, and inspiring they have been to our guests. 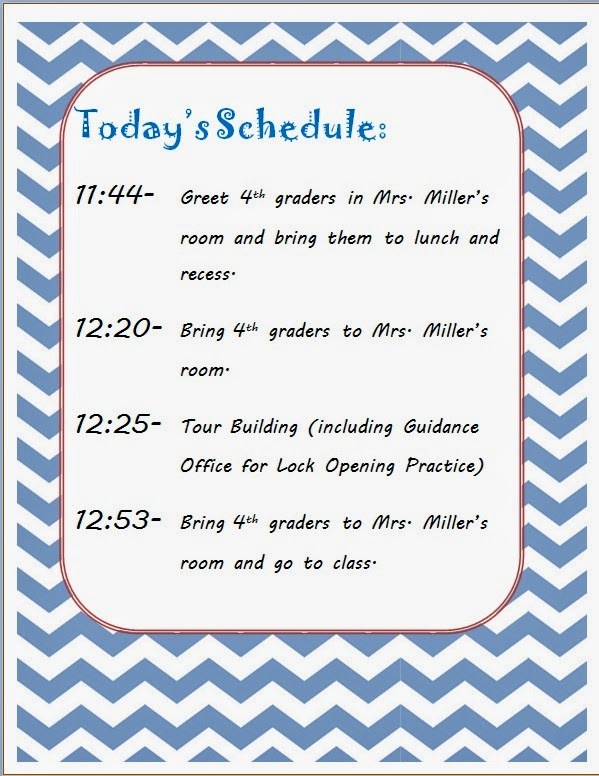 On tour dates, the 4th graders came at 11:40 am, which was the 5th grade Lunch and recess time. 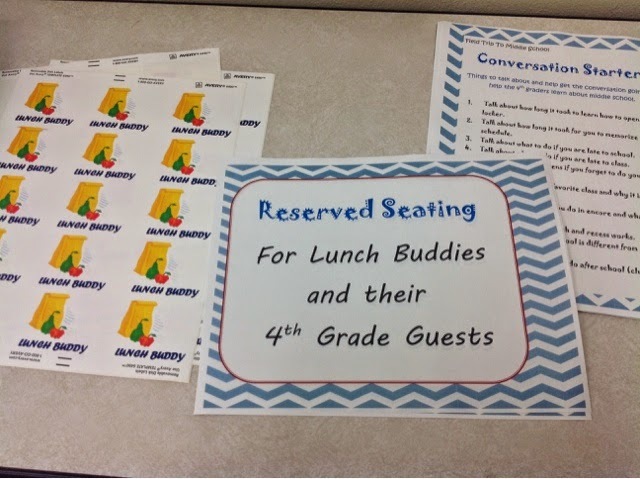 5th graders who were assigned to be a Lunch Buddy, came in and grabbed a badge and sheet of conversation starters. Then they lined up in the hallway--one side for those that eat first, and the other side for those that had recess first--and waited until I split the 4th graders into one of those two groups. As the 4th graders got off the bus, I greeted them at the front door and handed them a name tag. I also took a class photo and then walked them down the hall to where the 5th graders were waiting for them. Once they were all divided, the 5th graders did the rest of the work. 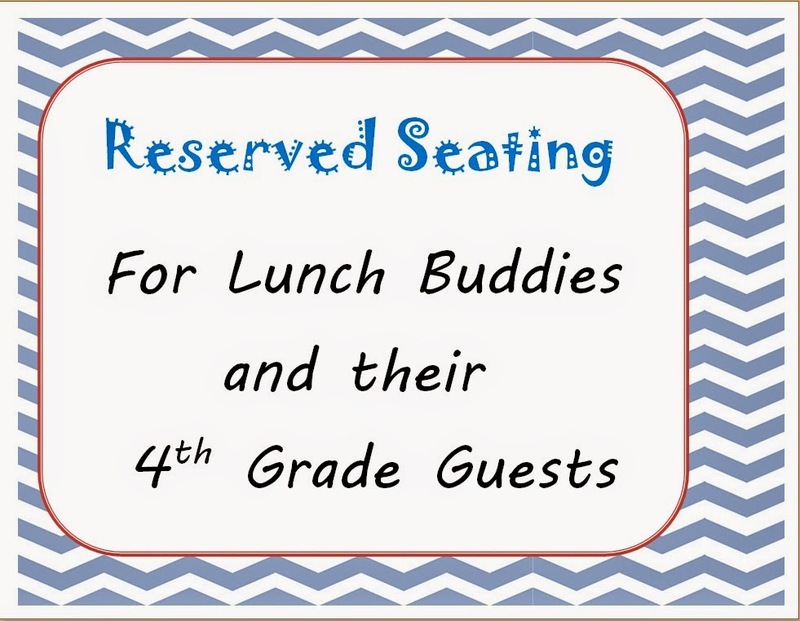 In the lunch room I had reserved seating. The kids really felt special having their own space. When lunch/recess was over they all returned to my office. Most of the 5th graders went to class but I had 6 tour guides waiting to show our guests around the school. Before we went on the tour, I showed the 4th graders the video we made for them. After the video the groups split up and toured the school and went to. . . 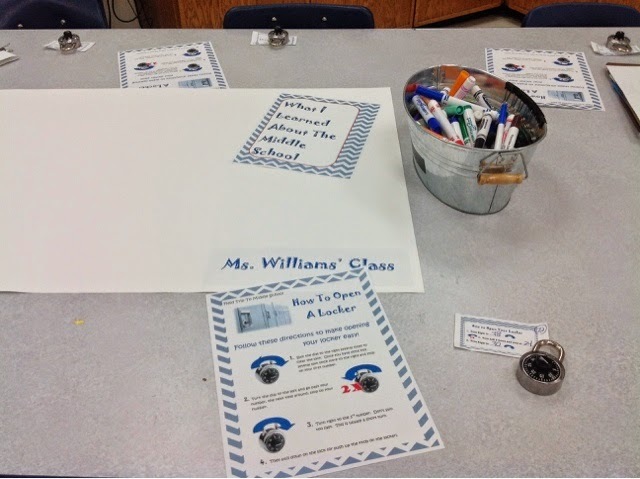 I had locks set up on the table for each student to try. I gave a mini lesson and my fabulous tour guides moved from student to student to help them open their locks. Once they open their lock, I had a bucket of candy from which they could choose a piece. 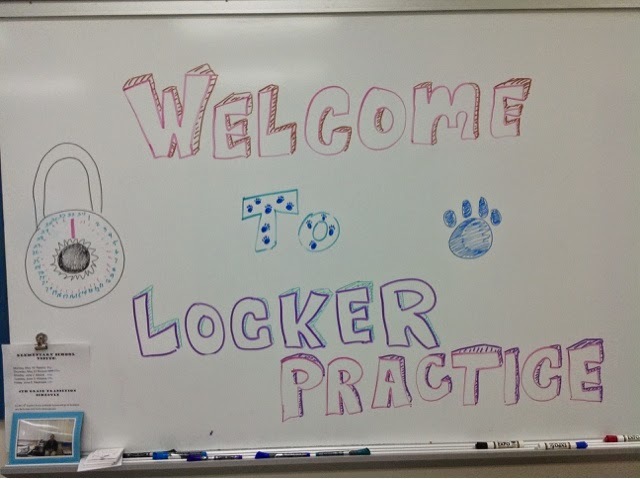 I had about 6 fourth graders working on opening locks at one time and had 2 tour guides in the room with me to help. 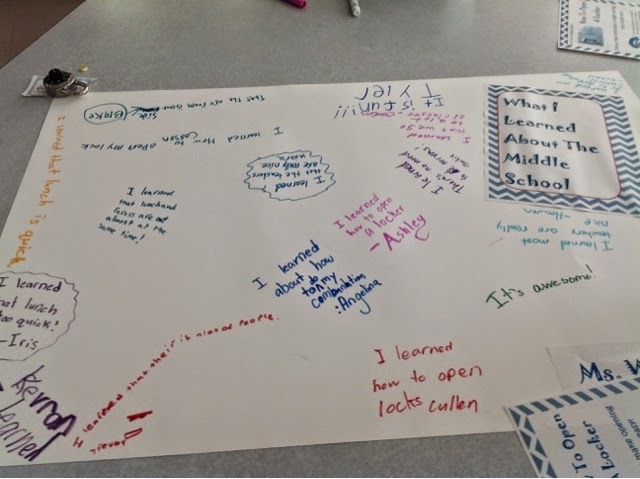 And since the 4th graders came over without their teachers, I sent this back with them for their teacher to hang up as a reminder that middle school isn't such a bad place. Just before they left I showed them this video. The handouts I used can be found in my TpT Store. What do you do for transition? Join in the conversation. . . They eagerly came to my room to make sure we had made them a name tag. Our service is to provide our customers high quality essays and assignments according to their requirements get best and buy essay service for your success. Keep sharing more, such posts and websites are very helpful. Keep posting.pixel gun 3d hacks . Thanks a lot.